The first audio recordings from the Mariana Trench, the world’s deepest point, are creepy as hell. Among the sounds captured by an autonomous vehicle, an eerie 3.5 segment was especially mysterious, and it was captured several times from autumn 2014 to spring 2015. In other words, scientists couldn’t figure out where it was coming from – or what made it. After months of analysis, they might finally have the answer: a whale signal, unlike any other we’ve heard before. The sound spans frequencies as low as 38 hertz and as high as 8,000 hertz – humans can hear between 20 and 20,000 Hz, so it’s within audible range, and it covers a very broad frequency. Because sound waves travel great distances in water, the source can be kilometers away so it could be almost anything. Without knowing where to start, they began to eliminate possible sources. Firstly, they eliminated man-made sounds. “The sounds reported here are not similar to known anthropogenic sources such as noise produced by ships or seismic airguns,” the team reports. Visual representation of the recording, showing five distinct parts. Credit: S. L. Nieukirk et al. Then, they moved on to geological sounds but again, nothing fit the sound profile, and in the end, all they were left with was a biological source – a whale. Although these sounds are absolutely unique in recorded history, Nieukirk found an equally bizarre recording from Australia’s Great Barrier Reef, coming from dwarf minke whale – the so-called Star Wars minke call. 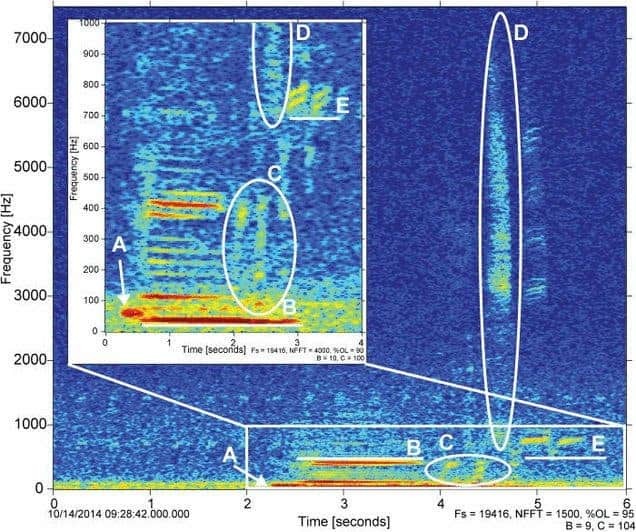 Although different, the minke whale call had some similarities to the Mariana Trench one, in terms of frequency and structure. “The complex structure of the Western Pacific Biotwang sound, the frequency sweep, and the metallic nature of the final part of this call are all very similar to characteristics of dwarf minke whale Star Wars calls,” the team concludes. But even if this is a call from minke whales, the big question still remains: what kind of a call is it? The first option would be a mating call, but mating calls are seasonal, and this sound was heard constantly. If it’s something else… then again – what could it be? In the end, as Nieukirk says, good science will explain it. “It really is an amazing, weird sound, and good science will explain it,” says Nieukirk.